The â€œAlphabet Songâ€, also popularly known as â€œABCs Songâ€ is sung in preschools across the world to teach English language alphabet in an entertaining way. The song recite the name of letters from A to Z of English Language in a sequence. Kids recite or sing the song to learn and practice their ABCs. In the United States, letter Z is pronounced as Zee instead of Zed. However, in most of the English-speaking countries such as Australia, Canada, and , children pronounce Z as . Thus, variants of the song can be found to accommodate the zed pronunciation. 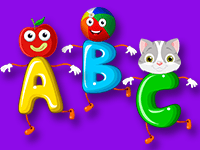 Learning â€“ Preschoolers learn to identify and memorize the letters from A to Z. Sing along to the video and learn your letters in a fun way! Next time you can sing with me. I can sing my abc’s.